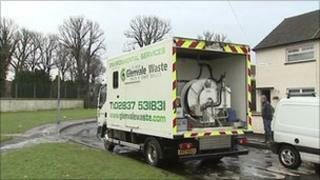 Residents of a County Armagh housing estate have expressed anger after sewage flooded through their homes. They said that no-one from NI Water had come to the Shankill estate in Lurgan despite repeated requests for help. Upper Bann MLA John O'Dowd said the response had "not been good enough" and added that he would be asking "serious questions" of the company. NI Water has said it is doing as much it can to help those affected by the "unprecedented" problems. It is believed the problem at the row of houses was caused by overflowing drains unable to cope with the thawing ice. One of the residents, Bridie Bunting, said water had come up through a manhole and then through the whole of her house. "Everyone has been contacted and nobody came near us," she said. "I am 73 and the lady beside me, she is 77. She has just recovered from cancer and I am a diabetic with a broken shoulder. We are very distressed." Mr O'Dowd said he wanted NI Water to account for its response. He added: "The thaw was forecast. We are in the middle of the holidays and we accept that - people who have had their homes flooded accept that - but someone should have been here to help these people."